Heading home from an out-of-town job on a wet and miserable night, Cal Weaver stops at a red light close to Griffon, New York’s local hangout spot. When a teenage girl taps on his window and asks for a lift, Cal knows it’s the height of stupidity, but the fact that the girl recognises him as "Scott’s father" causes him to renege. In the darkness, he can’t see much, but he does notice the scratch on the back of her left hand. Claiming to feel ill, the girl asks Cal to pull into the nearby fast food restaurant. When she gets back into the car, the scratch is gone, the original girl replaced by someone new. When one of the girls turns up dead, and the other is reported missing, Cal finds himself dead centre of the police investigation. But there is more going on here than the disappearance of a teenage girl, secrets and political enmities that define the small town of Griffon and which, if he follows the trail, may lead Cal to some understanding of how his own son died eight months earlier. Linwood Barclay recently described the first chapter of his novels as a hook designed to draw the reader into the story. In the case of A Tap on the Window, this is certainly very true: we’re as intrigued by this switch as Cal Weaver is, and the book quickly becomes that old cliché of reviews of thriller novels: unputdownable. Far from a cliché itself, though, the story is original and engaging, drawing the reader ever onwards, increasing the sense of mystery and tension in tandem, notch by notch, as we progress through the chapters. Told from the point of view of Cal, a private detective and ex-policeman, we see the town of Griffon as he does: as an outsider who, despite having lived here for six years, still doesn’t have the full measure of the town. There is a Stepford or Midwich feel to the town, a certain quality that sets it apart from the rest of small-town America: the police force seem to be a law unto themselves, beating out-of-towners or young troublemakers rather than going to the trouble of processing them through official channels, sexually assaulting young women in the guise of searching them for illegal substances. The town’s mayor is a lone voice in condemning this approach, the vast majority of the townspeople happy to have a peaceful town, unaffected by the sort of trouble that plagues the city of Buffalo, a mere twenty miles distant. It’s this setup, a large group of otherwise seemingly normal people who live in fear of the big bad world bursting their tiny little bubble of peace and harmony, that makes the setting feel slightly odd and gives the reader the uncomfortable sense that what’s going on may not conform to our usual expectations. Cal is an unwilling participant in the events of the novel, drawn into the mystery through sheer bad luck, and a nagging need to see the mystery through to the end. He’s a man with baggage: his teenage son threw himself from the top of a four storey building while high on Ecstasy eight months prior to the story’s opening, and it’s a burden that still weighs heavily on Cal’s mind, affecting his relationship with his wife, and also with the people in town who knew his son prior to his death. Cal has a short temper, which frequently leads him to trouble, and while the reader never suspects for a minute that Cal could have been involved in the death of the second young girl, it’s obvious to see why the police might view him as a suspect, under the circumstances. In some ways, this defect makes Cal more real for the reader, and certainly more human than his fellow Griffoners. Barclay carefully has carefully constructed his plot, and his characters, to keep the reader in the dark as much as possible. It is impossible to know who to trust, and who to suspect, all helped by the first person point of view that removes any outside influence for the reader. When the revelations come, and they come thick and fast as the book approaches its climax, they are surprising and, best of all, satisfying. Barclay doesn’t make life easy for his central character, though, so expect to be shocked. It’s a wonderfully-written novel, a very literate thriller that manages to move at a cracking pace without resorting to the usual tricks of the trade: short chapters filled with short sentences, or screenplays barely re-written in prose form. Barclay has an ear for the language used in northern New York state and, as a result, the dialogue flows with ease, worthy, perhaps, of comparison to the dialogue of the late, great Elmore Leonard. 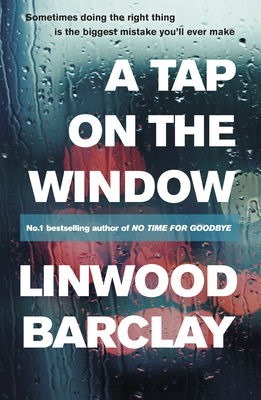 The perfect hook to get the reader interested in the first place, and enough substance to keep them turning pages once the scene has been set, Linwood Barclay’s latest novel, A Tap on the Window, is a masterclass in thriller writing. Intelligent, witty, exciting and with a touch of oddity that serves to set it apart from others in the genre, this is crime-fiction escapism at its finest. It’s my first experience with Mr Barclay; it certainly won’t be my last.